College hour was packed with students waiting to hear author and English Professor Christian Kiefer read from his newest novel, “The Animals” Tuesday. 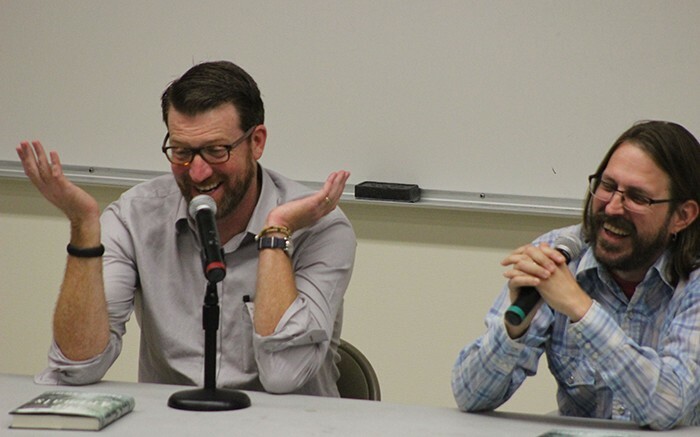 Kiefer followed the reading with a question and answer session alongside fellow author and English professor Michael Spurgeon. Kiefer explained his process of creating “The Animals”, and gave some background on how he researches for his books. Part of his research involved delving into the drug culture of Reno, Nevada in the 1980s. “I found a group chat on Facebook called ‘If you’re from Reno, then you remember…..’ and I put a note up that said, ‘Hey, if you were gonna score cocaine in 1984, where would you go?’ I got like 70 responses within an hour and a half,” Kiefer said. Kiefer explained how he interviewed several different drug dealers and prostitutes in the Reno area to get a feel for recreating the drug happy days of Reno in the ’80s. The main character of “The Animals,” Bill Reed was embroiled in this seedy culture as a teenager, but has since become the manager of a wildlife sanctuary in Idaho, wanting for a quieter life. “The Animals” deals with Bill Reed’s struggle to realize his true identity, having lived two very different lifestyles as a teen and as an adult. Professor Spurgeon also answered questions after the reading, and noted how extensively Kiefer researches for his books. “Kiefer is working on another book now about cartographers and the Napoleonic Wars, and he flew all the way to Europe to travel around and see the landscape,” said Spurgeon. “He really didn’t do the things that people do when they go to Europe, he didn’t go to the Louvre,” he said. Kiefer said to really get a feel for the setting he wants his books to have, he has to put his feet on the ground to get a sense of what is like to live in that area, whether it’s Reno or Europe. Spurgeon also brought up two main themes he thought were important in “The Animals”, how your career is not your identity, and how living in the moment disguises our true identity. Spurgeon commented on what he believed was a core issue of the book, how one’s true identity never changes. Be the first to comment on "ARC Professor reads from his new book, “The Animals”"